Research from CSU shows how regional areas can be welcoming to immigrants and can offer positive life experiences, contrary to popular belief. Research from Charles Sturt University (CSU) shows how regional areas can be welcoming to immigrants and can offer positive life experiences, contrary to popular belief. Research by Associate Professor Branka Krivokapic-Skoko from CSU's Faculty of Business and Professor Jock Collins from the University of Technology Sydney (UTS) shows immigrants in non-metropolitan areas feel welcomed, have positive labour market experiences and interact with their community. "Immigrants showed a high rate of economic participation, and only seven per cent of the survey participants were unemployed at the time of the survey," Associate Professor Krivokapic-Skoko said. "For almost half of the respondents it took only up to a month to find their first job, and one in five found their first job within two weeks. "Additionally, the immigrants were highly educated with almost 95 per cent holding at least a high school certificate, 45 per cent holding a university degree, and almost 20 per cent holding a postgraduate qualification." The survey was the first national survey of new immigrants living in non-metropolitan Australia, and included almost 1,000 immigrants. Associate Professor Krivokapic-Skoko believes the results should encourage regional communities to welcome immigrants and broaden their interaction, with the results showing immigrants were satisfied with their life in regional areas and would recommend their home town to friends and family. "Two-thirds survey participants are currently still living in the town that was their first destination in Australia and more than 80 percent of them would encourage relatives or friends to move to the area," Associate Professor Krivokapic-Skoko said. Regional areas proved to be a welcoming and friendly environment with ninety five percent of survey participants indicating that the community made them feel either very welcome or somewhat welcome. "Immigrants showed a relatively high level of interaction in society with eighty seven per cent of the respondents having visited their neighbours since moving and being likely to take part in local community activities," Associate Professor Krivokapic-Skoko said. "Immigrants show a high level of social interaction, feelings of being welcome and willingness to stay in the community long-term. I believe that this demonstrates how settling immigrants, including refugees, is a viable option for regional communities and will result in positive life experiences for all involved." 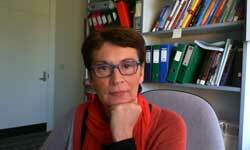 Associate Professor Branka Krivokapic-Skoko is based in Bathurst and is available for interviews. Please contact CSU Media for more information. Attraction and Retention of New Immigrants in Regional and Rural Australia (2008-2011)was funded by the Rural Industries Research and Development Corporation.